First Friday Mass Friday, September 7th @ 9 a.m.
Picture Day Wednesday, September 12th! Cook Out Friday, September 14th at 5:30! Trick or Trunk at Parish Friday, October 26th! How to make good choices & learn how every choice has a good or bad consequences! ​Bring in new adult winter hat for the Mother Teresa Outreach Ministry! Calling All Veterans! Thursday, November 8th- students in grades 3-8 are invited to ask a relative to join us during an assembly to honor them for their military service! :) See parent email for more information. ​Please return permission slips for the Christmas Concert Rehearsal Thursday, December 13th at the Parish ASAP!! 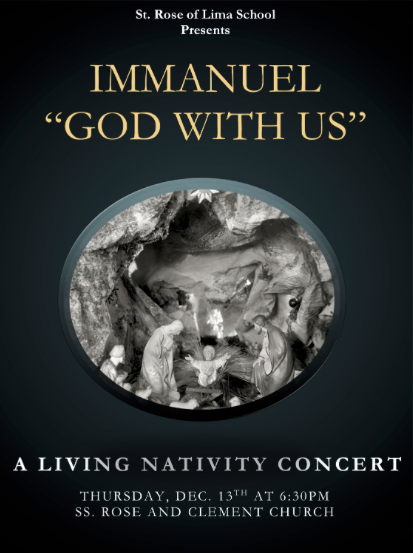 ​Christmas Concert & Living Nativity Thursday, December 13th 6:30 p.m.​​ See attachment below! ​Letters were sent home last week with information on Renaissance Home Connect! Please use the following information provided on that sheet to view information on your child's progress in Accelerated Reader!